Applications: 8 - 35 Hp / Gearcase: 2-1/2"
Turning Point Rascal Aluminum Propeller Series for small horsepower outboard engines. 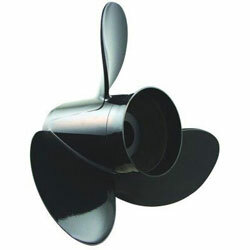 Rascal aluminum boat propellers improve the overall performance of small HP engines. Specially designed propeller blades maximize top speed, acceleration, and grip on the water - no more blowouts caused by excess ventilation! These are the best aluminum boat props available for small horsepower motors!